Moisture is one of the most frequent causes of coating failure as well as construction defects. Applying paint to a substrate that is too moist will frequently lead to failure of the film. Most substrates that absorb water have to be below a specific moisture level percentage before paint can be applied. A moisture meter is an ideal QC tool to determine whether a substrate is ready to be coated. Moisture meters are particularly useful in all phases of furniture manufacturing. Proper use of a meter can ensure that the wood will maintain dimensional stability so that costly defects such as splitting, warping, and delamination will not occur. A higher level of unacceptable moisture tells the operator that additional drying of the lumber is needed before it is ready for production. We offer two pin type penetration meters. These meters operate on the principle of electrical resistance; they use the substrate as an element in a circuit by driving two pins (electrodes) into material being tested. The water in the sample material is an excellent conductor and most dry substrates are effective insulators. The m100 Moisture Meter has a compact, easy to carry design with calibrations for wood and building materials. The m100 is an economically priced solution for building contractors, painters, and inspectors. The m200 Moisture Meter has a large, easy to read display. There are 8 material group calibrations for increased accuracy. 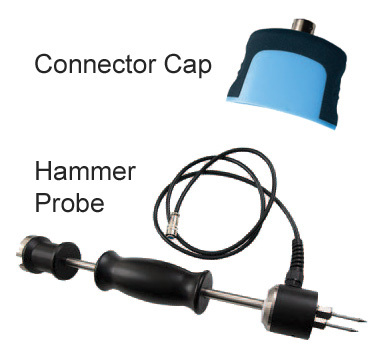 The m200 has an interface connection for an optional Hammer Probe. Dimensions: 3.8 x 1.6 x 0.8 in. 6.3 x 2.4 x 1.1 in. Weight: 0.18 lbs. 0.45 lbs.